Let’s be honest – after a hard day at the office and a stressful commute home or a busy day at home preparing breakfasts, packing lunches, carpools, several after-school activities, homework, making dinner, and taking care of the dishes – we all long for just a few precious moments of silence, serenity, and rejuvenation. 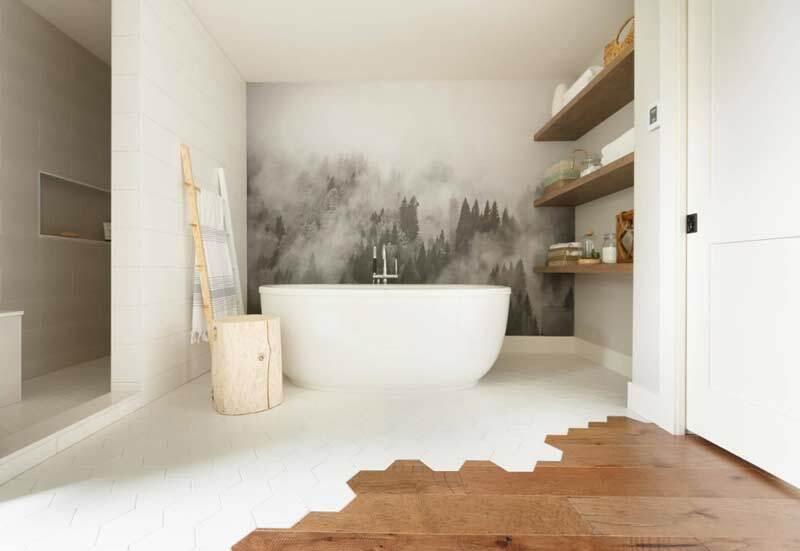 That’s why so many on Pinterest are looking for an inspiration and ideas to create their own home oasis – spa-like bathroom with nature-inspired design elements, serene wall art, and reclaimed wood textures for a soothing effect. 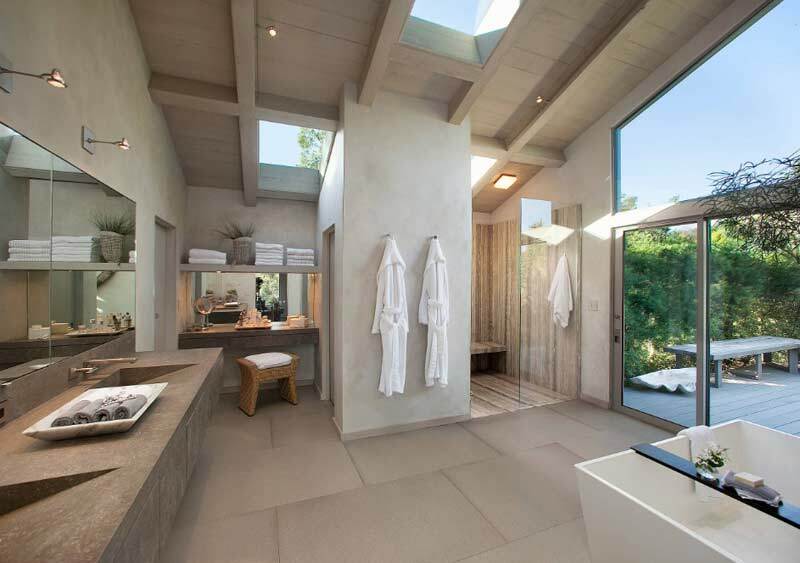 Natural stones, custom teak wood furniture, rain showers – these design elements not only bring energy into the environment but create a spa-like atmosphere to nurture the soul and bring peace and calm to the mind. Let explore some of the timeless design trends that will help you create your own oasis. No matter what Pantone color of the year is dominating the charts, you’ll never find bright colors in a high-end spa. The colors that you see in nature, such a warm whites, cool greys, muted blues, and calm greens will always evoke the mood of tranquility and peace. You can still create a visual interest with a natural palette by including various shades of earth tones throughout your space: walls, plush towels, vases, textured rugs, floor tiles, and wooden accents. Elements we find in a natural oasis, such a stones, plants, water, and the sky will do the trick to recreate a similar atmosphere in your spa-like bathroom at home. That’s why skillful designers will place a free-standing oval tub by a picturesque window surrounded by stone tiles and statement plants. Oval-shaped bathtub makes a luxurious statement while its sleek form adds an organic yet modern touch for your spa-like bathroom. Add a few reclaimed wooden elements, such as a towel ladder, wooden centerpiece, black rocks for a hot stone massage and you have created your own everyday spa on a budget. Remember the gentle massage from a waterfall you stumbled upon in the mountains? Why not recreate a similar experience at home with a rain shower that will bring the serenity of nature and healing powers of water to soothe your muscles and body aches? Close your eyes… what is the first thing you remember about your last visit to the spa? It is probably the invigorating smell of lemongrass and lavender essential oils. Don’t forget to incorporate essential oil diffuser for your spa-like bathroom at home. While lavender and chamomile reduce stress and promote deeper sleep, citrus and peppermint will help sharpen focus in the morning. Strategic sensory infusion of essential oils will help you create a perfect environment for your at-home-getaway oasis at any time of the day. Candles instead of bright lights, soft music, a serene wall art, and potted plants – all these natural elements will put the necessary finishing touches on your home spa oasis. 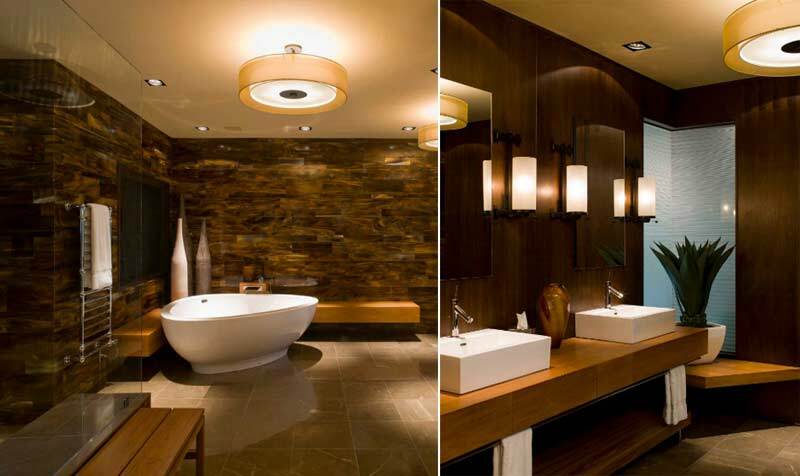 Check out these spa-like gorgeous bathrooms and get inspired to create your own oasis at home! What makes this space so marvelous? The use of natural light, play on reflection (check the mirror wall! 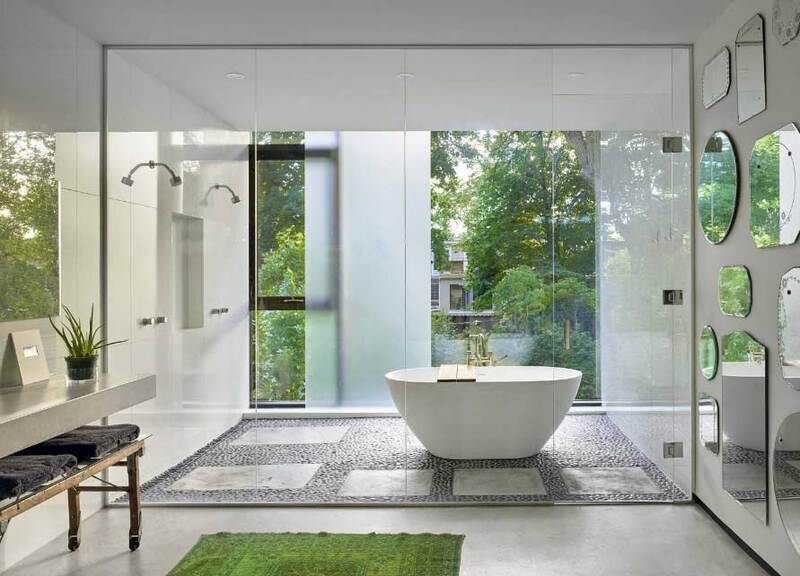 ), open shower, stone floor, simple lines. While you may not have that much space in your bathroom to devote to your spa-like dream oasis, keeping it open and simple always helps. 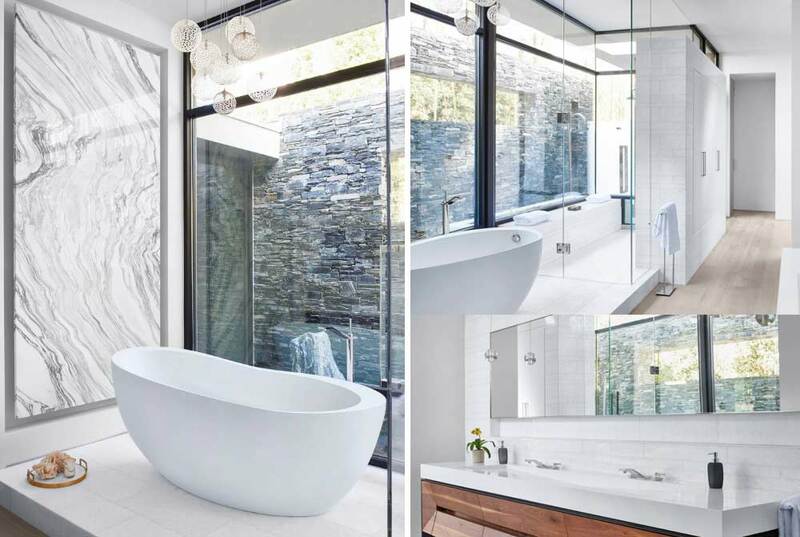 This spacious master bathroom with lots of natural light feels relaxing and luxurious thanks to a contemporary palette and finishing touches, such as concrete countertops, waterfall faucets, and a modern bathtub. In geometric waterfall faucets, the open-flow spout forms a luxurious stream reminiscent of natural cascading water. While shades of white are always in style, it may not be ‘your cup of tea’ and you may be drawn to a darker color scheme. 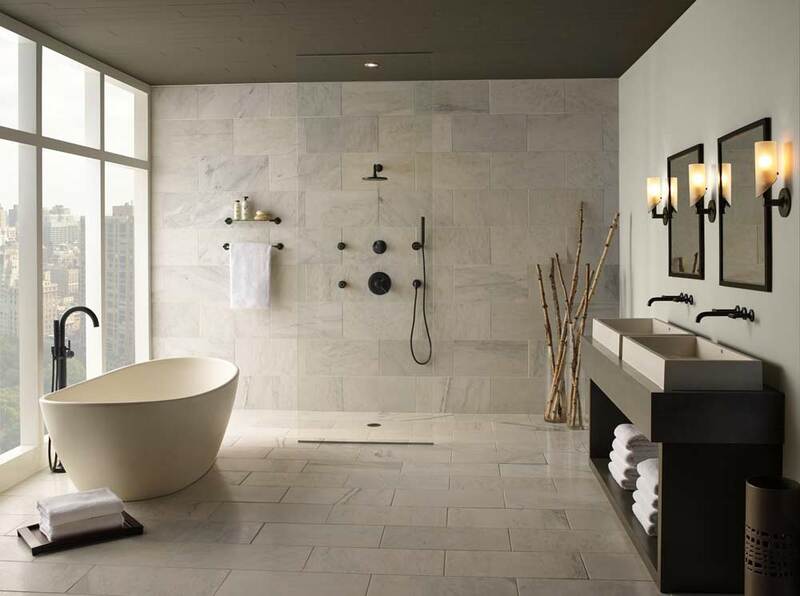 This beautiful dark spa-like bathroom accentuated by natural stone and contrasting white decor elements easily sets the mood for a relaxing end-of-the-day ritual. As modern farmhouse style still holds its favor with homeowners, this spa-like bathroom retreat blends just the right amount of rustic and elegant details. The white sculptural bathtub adds contrast to dark tile floors while bringing the focus on the elegant stonework of a walk-in shower. Lots of natural light though perfect for a candle-light night in. 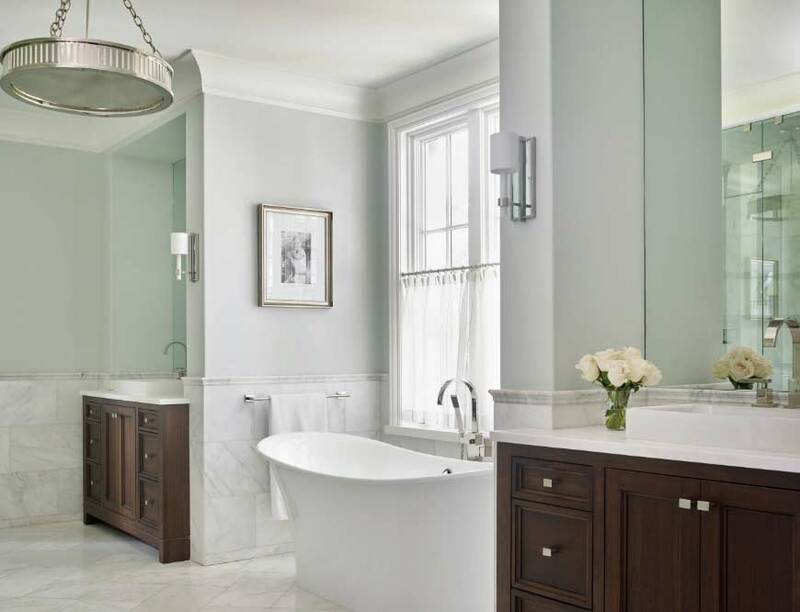 You don’t need a huge bathroom to create a unique and elegant space you’ll enjoy: tasteful light fixtures, modern shape sculptural bathtub, your favorite picture on the wall … it will help you relax and rejuvenate your energy. The main design element here is a view but what a great use of space: there is nothing to distract you from taking it all in! Great lesson in minimalistic approach to creating a perfect dreamy oasis. 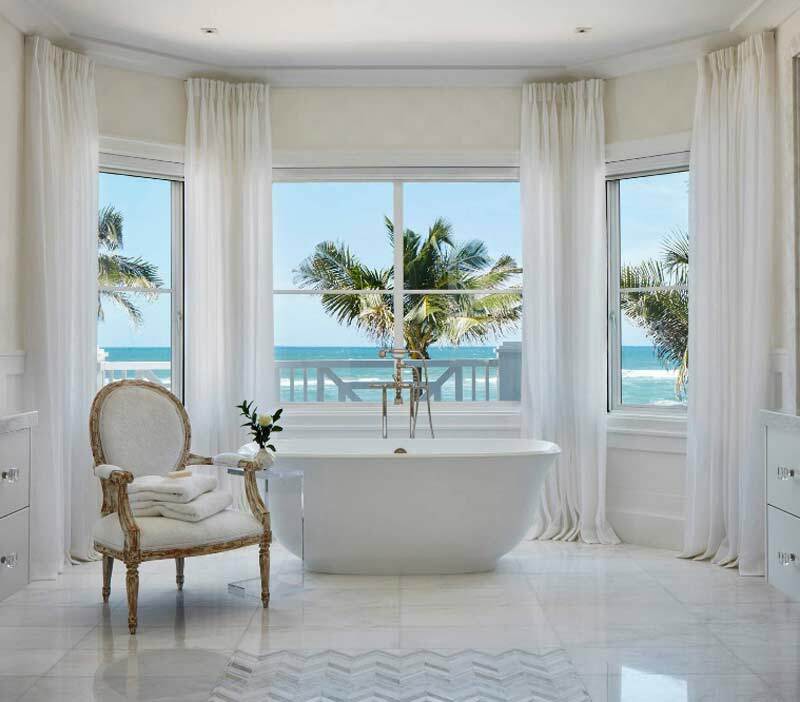 No matter how big or small your bathroom is, you can create your own paradise. This modern house in Australia gets a special mention for simplicity, frugality, and ingenuity. Simple black accents, industrial-style lighting, modern grey bathtub, and lots of natural light – there are no distractions here, just the ingredients for success. 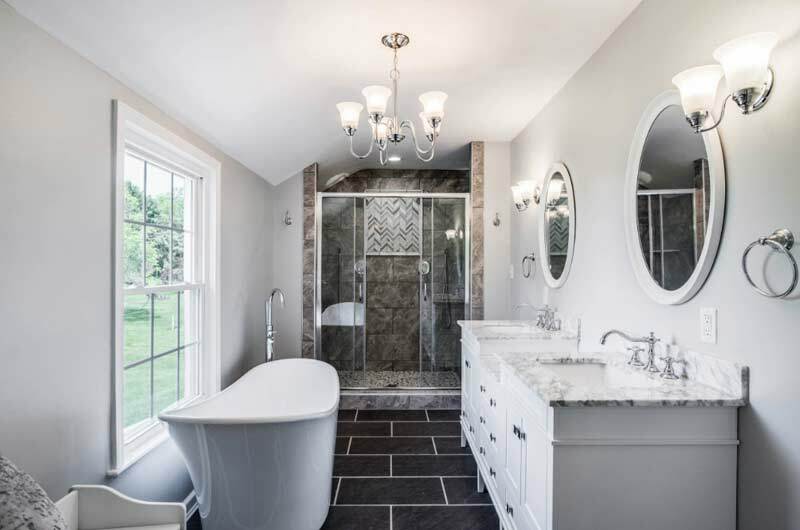 This elegant bathroom was named ‘bathroom of the year’ by Atlanta Homes and Lifestyles, for all good reasons. Simple placement of bathtub on a white platform, natural stone wall accents, elegant lighting create a fun and relaxing spa-like retreat. This modern take on classic interior space evokes the poetic beauty of Japanese haiku. 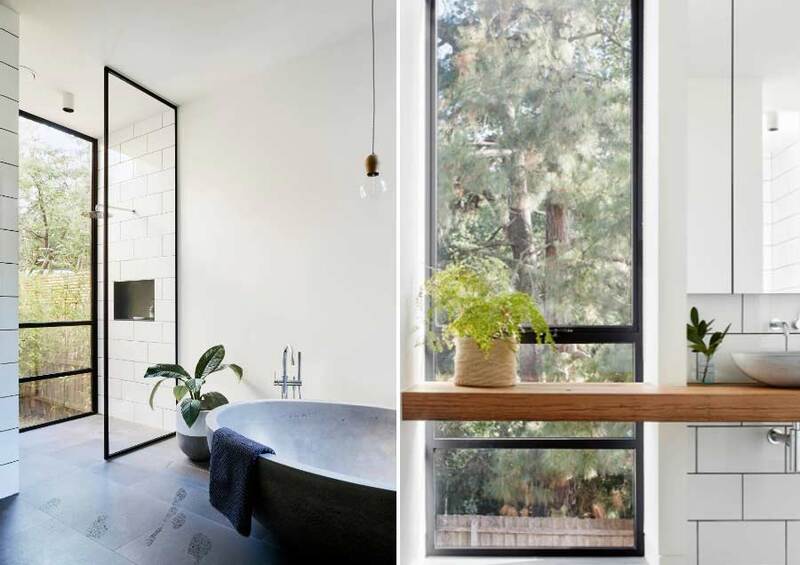 This simple, yet the well-balanced interior is ready to embrace your tired soul at the end of the day to nurture, rejuvenate, and bring back to life with its natural elements: water, air, plants, stone, and wood. 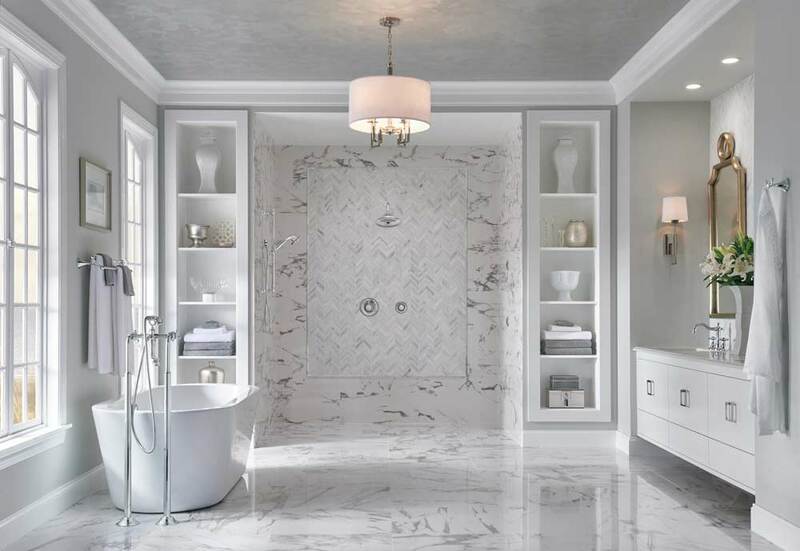 This white marble bathroom is as luxurious as it is relaxing with trendy open shower framed by storage shelves and a big white modern bathtub. 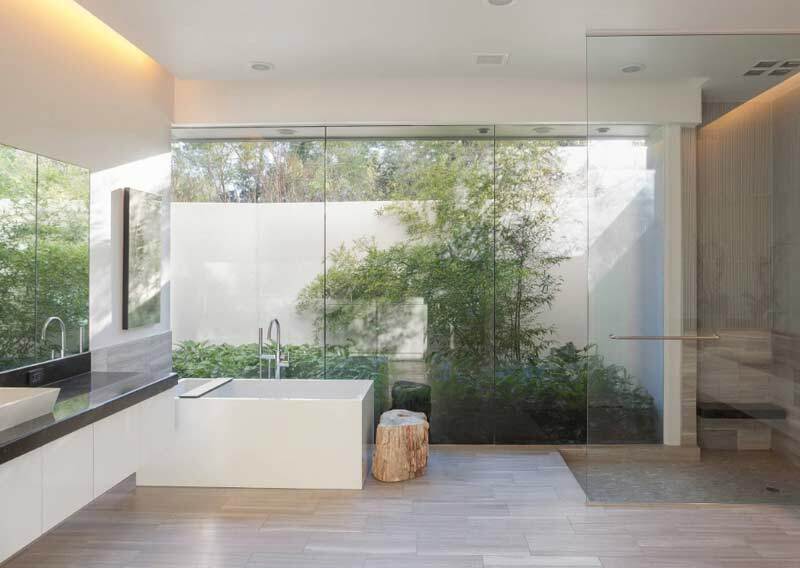 Breathtakingly simple, yet luxurious, this modern bathroom checks all the boxes for a spa-like retreat: a harmonious beauty of single open space, rustic accents, modern lines, and gorgeous details of the state-of-the-art hardware.